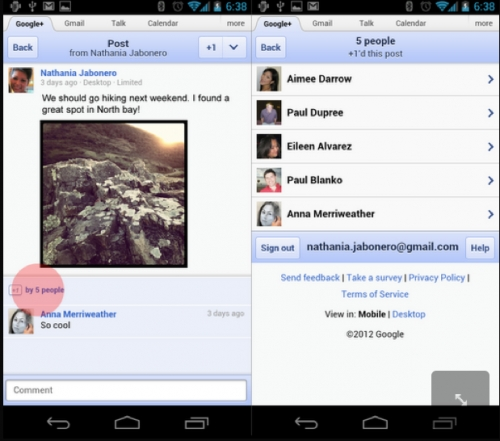 Google updates G+ mobile web app | Android Blast! Google has announced two new features to its Google+ mobile web app. The update brings the "What's Hot" stream to the mobile app, as well as the ability to see who +1'd a post. We've rolled out two new features in the Google+ mobile web app: What's Hot stream, and seeing who +1'd a post. - With What's Hot, you can now see some of the most interesting content being shared on Google+ with a flick of your thumb. To use it, just swipe to the right of your Circles stream. - To see who +1'd a post in the stream, just click on the +1 count underneath the post. It's a small improvement that makes it easier to engage with others around content. The new features are now available in the mobile web app, and will soon be added to the native iOS and Android apps.